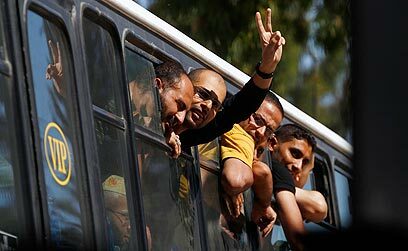 The second stage of the prisoner exchange deal that secured the release of IDF soldier Gilad Shalit will begin Sunday, as the 550 Palestinian prisoners included in the second phase of the deal will be released. On Thursday and Friday, the High Court has rejected several petitions filed by terror victims' families, contesting the release, effectively green-lighting it. President Shimon Peres is expected to sign clemency orders for 43 security prisoners slated to be released as part of the deal. Defense establishment officials stressed that none of the 550 inmates who will be released are affiliated with Hamas, and that none were defined as having "blood on their hands." The majority of the prisoners will be sent to the West Bank. Two will be allowed to return to east Jerusalem and 40 will return to Gaza Strip. The majority of prisoners were incarcerated for stoning, hurling Molotov cocktails and firearm offenses. Over 400 of them have served at least two-thirds of their sentence. The petitioners accused Prime Minister Benjamin Netanyahu of not presenting the government with clear criteria by which to choose prisoners that could be included in the deal, saying he "did not allow for a thorough process in the matter." Chief Justice Dorit Beinish, however, said that the de facto ruling on the release was made in October, when the High Court sanctioned the Shalit deal; adding that Israel must honor the deal made with Hamas. See all talkbacks "2nd phase of Shalit deal underway "